Michael Buchanan is widely regarded as an emerging artist of great interpretative intelligence and technical capacity. 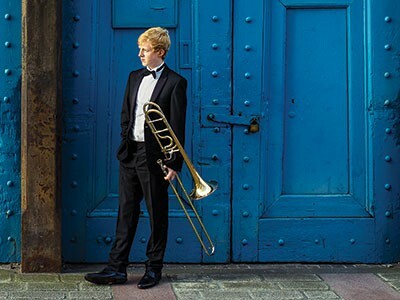 He is the recipient of both the First Prize and Audience Prize at the ARD International Music Competition 2015, as well as at the Ian Bousfield International Trombone Competition 2015 (first prize), and Royal Overseas League Competition 2015 (first prize in Wind, Brass and Percussion section). In 2015 he received the ‘Player of the Year’ award by the British Trombone Society. Engagements as a soloist for the 2015/16 and 16/17 seasons include concerto appearances with the Deutsches Symphonie Orchester Berlin, Stuttgart Radio Symphony Orchestra SWR, Symphonie-Orchester des Bayerisches Rundfunk and the Berner Symphonie-orchester, as well as recital appearances at the Lucerne Festival, Beethovenfest Bonn, BachFest Leipzig, Schwarzwald Musikfestival, Mecklenburg Vorpommerln Festival and the Wigmore Hall. In June 2016 he was the subject of a documentary recorded for the French-German TV station Arte, titled ‘The Stars of Tomorrow, with Rolando Villazón’. As an orchestral musician, Michael Buchanan regularly performs with orchestras such as the Wiener Philharmoniker, Wiener Staatsoper (where he currently holds a one year contract as member of both orchestras), the Saito Kinen Orchestra, the Philharmonia (London), and the Royal Scottish National Orchestra. During his training he performed as principal trombone with both the Gustav Mahler Jugendorchester and the National Youth Orchestra of Great Britain. After an appointment the age of 20, he spent 18 months as the principal trombone of the Orchestra of Scottish Opera.